While doubters are fleeing AMAT stock, rush to take the setup for an easy winning trade. Applied Materials, Inc. (NASDAQ:AMAT) reported earnings last night and Wall Street hated the results. The stock is falling 9% on the headline. The story went par for this quarter’s course. Management delivered a beat on top and bottom lines but the forward guidance was merely in line. Recently, investors want to see strong forward guidance upgrades. In this case, management was less than enthusiastic, so traders paid it in kind. Luckily for the bulls, AMAT stock came into the earnings report up 25% in a year. Compare this to the S&P 500 at just 15% so relatively speaking, AMAT is still doing better than average. But the trend is troubling. Year-to-date, the stock had been flat and now is negative for 2018. That is especially notable when you compare it to other technology companies like AMD which is up 16% YTD and is rallying this morning. So AMAT stock has work to do and this earnings dip is not doing it any favors. Click to Enlarge Fundamentally, AMAT is not expensive. 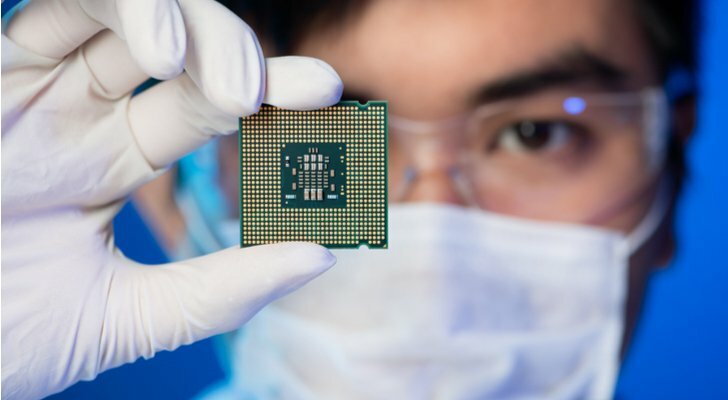 It sells at a price-to-earnings ratio under 20 so it’s cheaper than, say, Nvidia Corporation (NASDAQ:NVDA) or Intel Corporation (NASDAQ:INTC). But that alone is not reason enough to expect that Wall Street will run the stock up for a catch up trade. In fact, too many of the analysts that cover the stock rate it as a “buy,” yet it still is mired $20 below their average price targets. The longer it stays this far behind expectations, the higher the likelihood of surprise downgrades or price target cuts. Nevertheless, I still think that this is a good company worth a bullish trade on this dip. But instead of buying the shares on the first day down and hoping for Applied Materials stock bounce, I use options where I can create profits while leaving a sizable buffer for error. Once the stock stabilizes, I can add a debit call spread position to capture the bounce if and when it comes. Until then, I am happy creating income out of thin air and with plenty of room for error. The Trade: Sell AMAT July $44 puts, which is a bullish trade for which I collect $1 per contract to open. Here I have an 80% theoretical chance of success. But if the price falls below $43, I would accrue losses. We are now at elevated levels of uncertainty, so selling naked puts carries big risk. I can limit the risk by selling spreads instead. The Alternate Trade: Sell the AMAT July $44/$42 credit put spread, where I have the same odds of winning but with limited risk. The spread would deliver 20% if it wins. Neither set requires a really to profit. Click here for a more market coverage and get an ongoing free copy of my weekly newsletters. Article printed from InvestorPlace Media, https://investorplace.com/2018/05/investor-fears-today-in-applied-materials-inc-amat-stock-are-overblown-profit-from-them/.